Home/News, Sabah Travel Centre/Face of the Downbelow empire! What does the face of the Downbelow empire look like? When visitors pass by our KK Times Square HQ, the window stickers give a glimpse of what is offered! 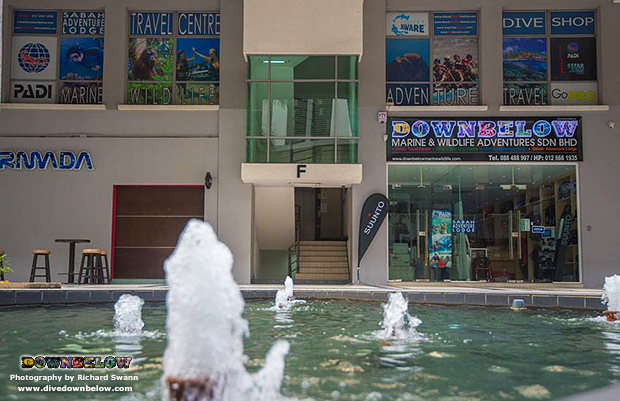 Based at the HQ, is our Kota Kinabalu Dive Shop on the ground floor, which is very obvious in the central courtyard of the Times Square complex. On the first floor, the window stickers above show all passers by the many activities we cater to, such as white water rafting, mountain climbing, wildlife safaris, marine-based activities and dream travel destinations! There will be more images showcased on the front of our KK Dive Shop doors and the windows of the Sabah Adventure Lodge above our Sabah Travel Centre and multimedia classroom facilities, which will reflect more of our vision and overall direction. Our location is Lot 33-G, Block F, so do come in to visit and see what adventure we can create for you in Sabah!